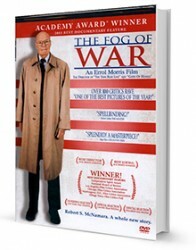 The story of America as seen through the eyes of the former Secretary of Defense, under President Kennedy and President Johnson, Robert S. McNamara. McNamara was one of the most controversial and influential political figures of the 20th century. Now, he offers a candid and intimate journey through some of the most seminal events in contemporary American history. He offers new and often surprising insights into the 1945 bombing of Tokyo, the Cuban Missile Crisis, and the effects of the Vietnam War.